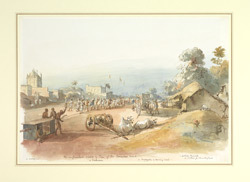 Watercolour of the Circular Road in Calcutta by Thomas Prinsep (1800-1830), dated c.1827-8. This image is inscribed, 'An unfinished sketch by Tom of the Circular Road; a mosque, a hakuree, a Kuranchee or hackney coach, a police tannah or station for chowkeydars'. Circular Road was one of the improvements implemented by Marquis Wellesley on his appointment as Governor-General in 1798. Part of the road followed Maratha Ditch, a defence that had been dug in 1742. The Prinsep family served in India for several generations. Thomas Princep was based in Calcutta from 1818 until 1830 when he died after a riding accident. He was in charge of the surveying of a large area of fresh and saltwater mangrove swamp in Bengal known as the Sunderbunds.